KVMGalore today announced it's shipping CM1284, a new member of the ATEN multi-view KVM product series. ATEN CM1284 makes multi-view operations simple by offering dual 4K viewing and Boundless Switching on the console side, which perfectly meet today's ever-increasing demand for multi-view functionality, real-time monitoring, effortless control, and a pleasant visual experience with clear and sharp content. ATEN CM1284 is specially designed for applications such as surveillance, control rooms, and command centers, which require constant and seamless switching and control between different computers from multiple systems to help make critical decisions in real time. 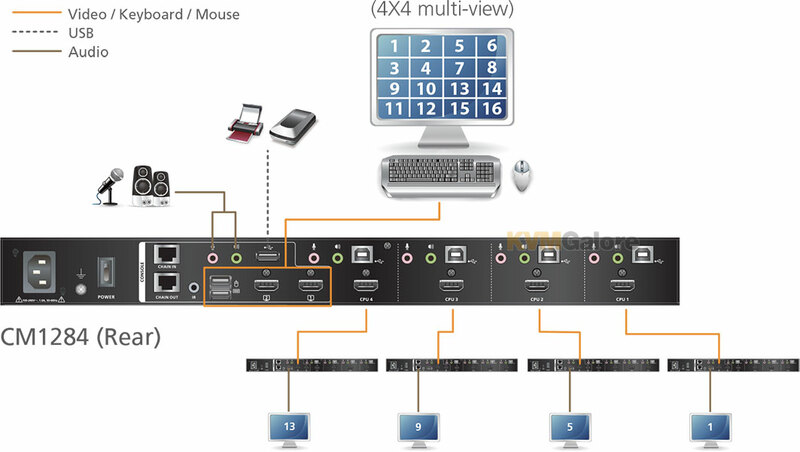 ATEN multi-view KVM product series, including the 4-port USB DVI multi-view KVMP switch, CM1164A and CM1284, delivers a range of supreme control solutions for multiple system operators. To provide better working efficiency with real-time and flexible display functions, ATEN CM1284 has a dual display that allows one to provide full screen mode while the other one provide versatile display modes for easy operation. In addition, CM1284 supports a better-defined HDMI connection with video resolutions up to 4K (4096x 2160 @30Hz) to secure superior video quality. The new features perfectly meet the needs for streamlining access to critical information from multiple systems, and bring instant control to the next level. Intuitive control with Boundless Switching: Boundless Switching, a patented ATEN technology, allows users to switch KVM focus among multiple sources on multiple windows by simply moving the mouse cursor. Featuring Boundless Switching, ATEN multi-view KVM product series makes it easier to instantly access and control the target computer. Clear and sharp 4K/Full HD video content: CM1284 supports dual 4K outputs, multi-view and full screen; CM1164A supports Full HD single multi-view output. Clear and sharp visual quality is guaranteed. Supports both daisy-chain and cascade connections: ATEN multi-view KVM product series supports great expandability in both cascade and daisy-chain modes. The series can control up to 3 additional CM1284/CM1164A from a single console with daisy-chain control (DCC), or can be cascaded up to 2 levels to control 16 computers/video sources. Versatile display modes: ATEN multi-view KVM product series controls up to four video sources on one screen with four display modes: Quad View, Picture in Picture (PiP), Picture by Picture (PbP), and Picture on Picture (PoP) display modes. In addition, users can easily change the size and location of each video source to suit their viewing needs. "In today's rapidly-evolving, data-hungry environment, professionals need to constantly switch control between different computers to use information from multiple systems simultaneously. As a solution provider with vast experience in both the AV and IT fields, we are excited to introduce ATEN CM1284 to our multi-view KVM product offering. Integrating more features to provide better working efficiency, the new ATEN CM1284 greatly facilitates real-time monitoring and control for multi-system operators and brings ATEN's multi-view KVM solutions to new horizons," said Daniel Schar, president of KVMGalore. For more product information and availability, please visit the ATEN CM1284 product page. * Boundless Switching is ATEN's brand name for the 'cursor switching' feature which allows switching between controlled computers by moving the mouse's cursor to the video being displayed from the computer that the user wants to control.